Welcoming a newborn child into the world is one of the most joyous moments, especially for the parents. However, this happy time usually comes with great responsibilities in taking care of the child. To ease such responsibilities, most parents usually opt for baby bassinets. These eliminate the need of having to constantly carry the baby around. They provide a comfortable and safe resting platform for your child. Bassinets come in various styles and models, but let’s look at some of the best that the market has to offer. This unit is designed for up to 5-month babies or those weighing a maximum of 20 pounds. It has the ability to rotate and swivel through 360 degrees. This motion helps bring the baby to you for a more close and safe sleep. Its sidewall is designed to lower easily so that you can take care of your baby while still in bed. The unit is highly durable and comes with a sturdy 4-point base that easily adjusts to fit 22 to 34-inch tall beds. For enhanced comfort, this bassinet incorporates a Polyurethane mattress pad that features excellent waterproofing. The unit also includes the nightlight, 3 lullabies, 3 soothing sounds, 2 levels of vibration, and a nursing timer. These are controlled by a 30-minute shutoff. In case you want to sleep next to your baby, then this unit will certainly help. It is designed for babies with a maximum of 5 months. It attaches easily to the parent bed to enable easy care and breastfeeding. All 4 sides incorporate breathable mesh that allows for effective air circulation. It comes with a pair of wheels on one side to provide easy manoeuvring. 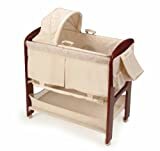 This bassinet is compatible with beds measuring at least 24 inches in height. Incorporating an elegant design, this unit allows your baby to rest on an incline. It has the ability to transform into a conventional bassinet by simply removing the incline sleeper. Smooth movement is provided by locking wheels. 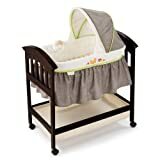 The unit can convert to a rocking bassinet and includes light vibes unit with classical music, variable vibration, nature sounds and soft-glow check light. It incorporates a mattress and a washable fitted sheet. This unit can accommodate babies weighing 3-15 pounds. This unit offers the best alternative to bed sharing. It is designed to attach easily to parental bed, which allows you to tend well to your baby. The unit incorporates 3 modes of use; co-sleeper bassinet and a playard. It includes a mattress fitted with a sheet and comes with a carry bag for easy transportation. It features excellent ventilation, thanks to the breathable mesh incorporated on the sides. This bassinet is perfectly crafted to complement any decor. It includes elegant embroidery detail and features an adjustable canopy that protects against intense light. The unit comes with 4 musical melodies, 2 natures sounds, 1 womb sound, and some soothing vibrations. It has a large basket for convenient storage of baby supplies. The bassinet is for babies weighing 4-15 pounds. Offering a 360-degree view, this bassinet is designed to provide effective monitoring of your baby. It incorporates customizable leg extensions that can adjust to various bed heights. The four castor wheels offer easy and smooth mobility. 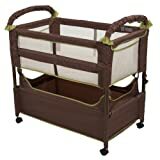 It has a storage basket that lets you keep essential baby items and supplies. The unit features a mattress fitted with a sheet strap and plate for enhanced comfort and safety. This unit is for babies of up to 5 months. This unit is made of 100 percent polyester for enhanced durability and strength. It features 3 modes that include bedside sleeper, freestanding bassinet, and a Playard. The compact size makes it an ideal choice for those small master bedrooms. It is designed for babies up to 5 months and fits beds with heights of up to 24 inches. 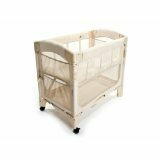 The bassinet incorporates a sheet fitted with mattress for additional comfort. This unit incorporates a quiet swaying motion that naturally soothes your baby to sleep. It is designed to allow for easy setup and assemble. The adjustable canopy offers enhanced protection to your child. It comes with beautiful embroidery detail that adds a touch of elegance to your bedroom. The unit has four peaceful melodies, three calming sounds and some soothing vibration that help lull your baby to sleep. The extra-large basket provides enough storage for baby supplies. This bassinet is designed for babies weighing a maximum of 15 pounds. It incorporates a rocking base that lulls your baby to sleep. The four casters provide easy manoeuvring of the unit. It has three plush toys with an adjustable height. The large storage basket allows you to conveniently store baby supplies so that they are within easy reach. This unit is JPMA certified and complies with CPSC standards. Incorporating a solid wood construction, this unit is designed to provide elegance and great stability. The handled basket enables you to effectively carry your child anywhere within the house. It has a changing table that attaches to the top when in use and clips underneath when not in use. 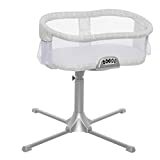 The bassinet incorporates an organizer and a diaper stacker for storing baby items and supplies. The interior is quilted and cushioned for extra comfort. Its breathable mesh sides offer good air flow. The bassinet is designed to accommodate babies weighing 3-15 pounds.